As a stand-alone taxi fare price calculator, Cab Grid Pro expects bookings will be managed by users’ existing systems. As such, booking data is emailed as text (and attached CSV file) for processing. However, with the Booking Management Add-on for Cab Grid, taxi bookings can be managed via the WordPress admin. Version 2.0 of the Booking Management Add-on for the Cab Grid Pro WordPress plugin introduces a range of updates and new features as follows. It is installed on our back-end demonstration website and may be fully tested. Please also refer to documentation for version 1 of the Booking Management add-on which details functionality this page builds on. Under the SETTINGS sub-tab of the Booking Management admin page there is now the option to compose custom email messages that are sent when various actions are performed. Each message will accept place-holders which will be substituted with booking data. Custom messages can be defined for ACCEPT/CONFIRM, DECLINE, PAID, and CANCEL actions. These messages will replace the default system message for each action when the corresponding button or bulk action is selected from the bookings table. The initial greeting (e.g. “Hi FirstName”), along with any further message entered in the action dialogue, plus a payment link (if available and selected) are automatically inserted in to the message. Messages are entered using the TinyMCE editor which allows formatting to be applied to text. An overall background colour for each message can be specified using the colour-picker below the editor. 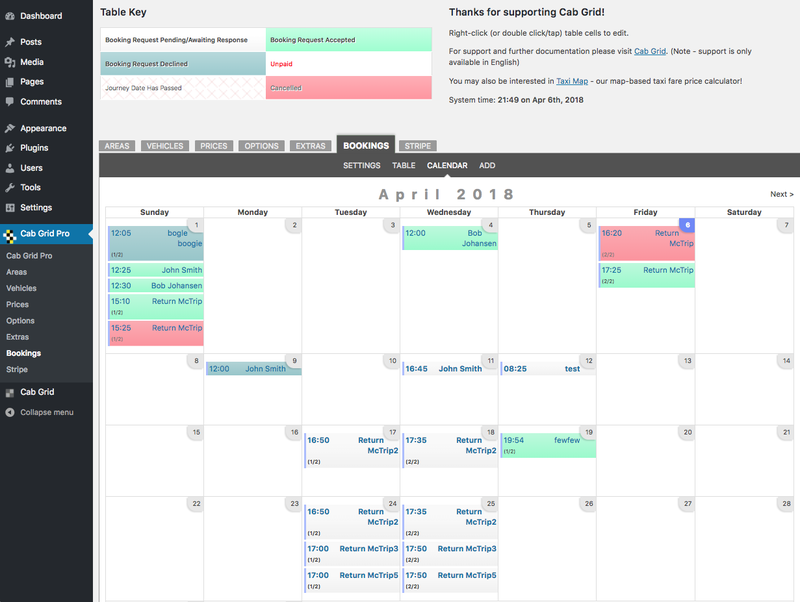 When accepting a booking through the Cab Grid Booking Management add-on a calendar event can be included as an attachment with the confirmation email send to the customer. This is a .ICS file which is compatible with most calendar applications. Some applications and devices will automatically add the event as well. Set this to “NO” to prevent the calendar event from being attached to the confirmation email sent to the customer. Also under the SETTINGS sub-tab, the Timing Conflicts section allows a tolerance for conflicts to be defined and (for the upcoming Cab Grid Pro v5) if the customer is notified of a conflict during the booking process. This section determines how vehicle selection inluences timing conflict detection. The add-on refers to vehicles defined in the vehicles tab of Cab Grid Pro. The first option, ‘Conflicts allowed if vehicles differ….‘ will NOT flag bookings that are requested for the same time if the vehicles selected are different. For example, Booking A is at 5pm in a standard vehicle, and Booking B is also at 5pm but in a executive vehicle. With this option selected, there would not be a conflict identified since the selected vehicles are different. In [the upcoming version,] Cab Grid Pro 5, this option will allow multiple bookings in a single vehicle type – up to the quantity of vehicles defined in the Bookings tab of Cab Grid Pro. The second option, ‘Timings must not conflict….‘ will consider any booking request within the tolerance time to conflict – and be flagged in the bookings table – irrespective of if the requested vehicles differ or there are more available. In the example above, Booking A & Booking B would be flagged as conflicting. Conflict Tolerance is defined in minutes. Any booking with either a pickup date/time or return date/time with less than the specified tolerance before or after another booking time will be flagged as a conflict. For example, if a tolerance of 60 minutes is set, a new booking requested any time between 4pm and 6pm will conflict with an existing booking at 5pm on the same day. Conflicting bookings will have a RED border at the right edge of their listing in the booking table. There will also be an additional CONFLICTS button under the ‘Manage’ column for that booking. When the CONFLICTS button is clicked, the booking table will be filtered for conflicting bookings. The Check Availability setting requires Cab Grid Pro version 5.0. When set to YES, this option will alert customers when they are selecting a pick-up or return time that conflicts with an existing booking pick-up or return time. By default, any existing booking, whatever its status, can trigger the conflict alert. However, this can be limited so that the alert is only triggered when the conflicting booking has already been ACCEPTED. Another sub-tab of the Bookings admin page is, ADD. This allows a new booking to be added to the system directly from the admin. A form is presented providing all booking data points including any custom form fields and extras. Once the form is completed, the ADD BOOKING button will store the booking in the system ready to be processed as if it was created from the Cab Grid Pro calculator on the customer-facing portion of the site. When switching tabs after a new booking is added, the admin interface page will be reloaded. Some booking data can be edited directly within the main booking table by double (or right) clicking on the table cell to be edited. However, not all booking data can be edited in this way. A new EDIT button under the ‘Manage’ column for each booking allows every piece of data for that booking to be edited. Unlike the ADD functionality, some booking status information can also be edited, such as cancellation date, acceptance date, or declined date. No notification is sent the customer when a booking is edited. Customers must be advised manually of any changes. Under the ‘Manage’ column in the main bookings table a DUPLICATE button is available for each booking. Clicking this button will load the booking data in a form where it can be edited before being submitted as a new booking. As with the ADD functionality, certain fields will not be available when duplicating bookings. Once any changes are made, the form should be submitted via the ‘Save Changes’ button. At that point the booking will be added as a new booking ready to be processed. Each booking supports a chronological log of activity. Events such as edits and actions (accept/decline/cancel/paid) are stored, along with the username of the admin triggering the event. The history log for each booking is available below the full details of the booking accessed via the DETAILS button. The CALENDAR sub-tab will render all bookings in a month-at-a-time calendar layout. The calendar is navigable up to the month of the latest booking. Entries are available for both initial and return legs of bookings. Return bookings are identified with a 1/2 or 2/2 designation. Clicking on a customer name will open the full details for that booking in a new window. 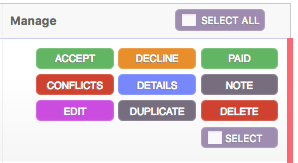 Bookings are colour-coded using the same colours as in the main booking table to designate their status. Available from either the calendar view or the main booking table, a daily itinerary shows a list of all ACCEPTED bookings for a day. In calendar view, clicking the DAY number (at the top right of each cell) will open the itinerary for that day. The count of bookings due TODAY. Clicking this item will open the daily itinerary for the day. A link to a dedicated payment page can be included with acknowledgement and confirmation messages sent via the Booking Management add-on. When the user clicks the link within the message, they will be directed to a stand-alone page on your site where they can make a payment using the available online payment options. For example, Paypal and/or Stripe. Any payment mechanism enabled for use at the end of the customer booking process will be available on this page. However, this page can be set to behave independently of payment processing displayed at the end of a booking. With this option selected, the full price as recorded at the time of booking will be charged. No deposit or surcharge formula will be applied to any payment method. If a deposit has already been paid, only the outstanding amount will be charged. If the formula reduces the amount due, the payment is considered a deposit. Only the deposit amount will be charged. The balance will remain outstanding. If a payment has previously been recorded (i.e. an earlier deposit), the full outstanding balance will be charged. If the formula increases the amount, a card-processing surcharge be applied. Any payment will clear the full balance due. The amount paid will exceed the quoted amount. Note: the actual price quote can be modified by editing the booking before sending the customer message. Whilst the main Cab Grid Pro plugin provides the ability to exclude dates for the whole system, the Booking Management Add-on enhances this by providing a means to restrict availability of specific resources (vehicles) at specific times. If a customer attempts to book a resource during a blocked out period, they will be presented with an error message and asked to adjust their settings. The resource (or vehicle) for which the period applies. A list of vehicles as added in the VEHICLES tab is presented in a drop-down menu. ‘Any Vehicle‘ can also be selected and will apply the blocked-out period to all resources. The start date and time. A date-time picker is presented. This is the date and time at which the blocked out period will begin. The end date and time. A date-time picker is presented. This is the date and time at which the blocked out period will finish. An ‘Add Dates‘ button will appear next to the last period. This allows a new period to be added when clicked. A ‘Delete‘ button. This will remove the period in that row from the blocked out dates. Once all blocked out dates and times have been entered click ‘SAVE CHANGES‘ at the bottom to apply the resource management. Data structure improvements allow for some additional data about each booking to be recorded. 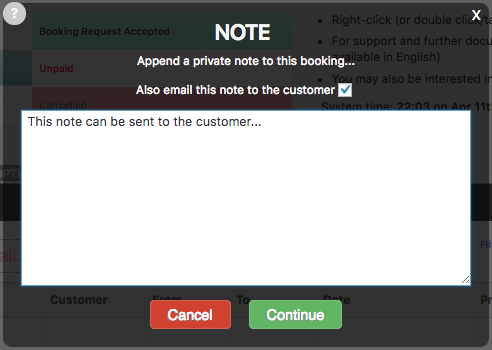 When entering NOTES via the main booking table for a booking, the note can optionally be sent to the customer. This is can be achieved by ticking the box above the note field. The search functionality has been updated to allow searching be vehicle name (which must exactly match the name entered under the vehicles tab), and also to look for terms within email addresses rather than requiring the full email address. Layout improvements have been made to provide a better more manageable experience on devices with smaller screen sizes such as mobile phones and tablets. I’m very interested in the new add-on as it’s what I was looking for. Can you please tell me how to purchase it?